We're live vivarium specialists. More specifically, we're the live vivarium nerds that zoos, museums, nature centers, breeders, and other pros rely on for proven supplies & advice. Our team is proud to offer the best prices, best service, most complete vivarium info, and the widest vivarium supply selection online. Our goal is to bring a piece of the wilderness indoors, and make wildlife we care for as comfortable as possible. Great live vivarium design meets at the intersection of horticulture & herpetoculture, and each member of our team has a personal background in one or the other. Although our company is no longer a commercial scale breeder, we still care for an expansive collection of Reptiles & Amphibians which we learn from every day. Our small team has over 30 combined years of hands-on experience with over 100 different species of Reptiles & Amphibians. 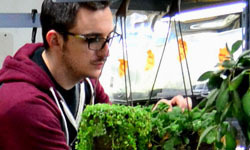 We put our experience to work while we pull orders to ensure every Vivarium Kit has contents which are conducive to the health of a specific inhabitant species. Free professional vivarium consultations are available to all clients who purchase corresponding Live Vivarium Kits, and we love having the opportunity to help. Scroll down to select another topic to learn more about our company! We're passionate about the many species we work with! While we no longer actively breed animals on a commercial basis, we still enjoy working with & caring for many different species of Reptiles & Amphibians. Nowadays, our goals focus on understanding the environmental requirements of each species. The hands-on experience gained from building & maintaining a wide variety of species-specific live environments has helped us to write our vivarium articles, animal care articles, design our vivarium supplies, recommend appropriate plants, microfauna, and more. We hope the educational tools & unique supplies offered on our site can help encourage more enthusiasts towards providing their animals with healthy live environments. Our team has experience with a ton of species in well over a dozen genera of exotic Amphibian, Reptile, & Invertebrate, and we'd be happy to assist with any husbandry related question we can. We encourage all our clients to patronize a rescue organization or private breeder when looking to acquire a new animal. If you are having trouble sourcing a certain species, don't hesitate to shoot us an email! Since hobbyist & commercial breeders make up a significant portion of our client-base, we're always happy to help support our rescue & breeder customers by sending business their way. This policy help our customers gain access to healthy captive-bred animals while ensuring the breeders & rescues who support us gain some business too. From an ethical standpoint, supporting breeders & rescues helps small organizations, curbs the demand for wild-caught animals, and often yields the healthiest pet. Our business has never engaged in, or supported the sale/trade of wild caught animals. For the good of the hobby & wellbeing of the animals we're all passionate about, we hope you'll support a local breeder or rescue, protect the wild animals you love, and help discourage the nation-wide trade of unnecessarily wild-caught animals. It really is as simple as not patronizing a business which sells wild caught animals, and instead checking out a local rescue or breeder to source your pet(s). 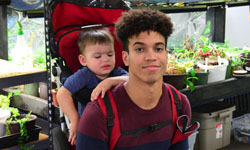 Mike has cared for exotic pets & live vivarium environments since he was a student, and has worked with over 70 species of animals over the years. Having grown up in & around his family's wholesale flora business, he spent much of his life working with & shipping perishables before opening New England Herpetoculture. Mike is responsible for product & business development, marketing, and coding the website. On the incredibly rare occasion that Mike isn't working, he spends his time gaming, working on cars, building stuff in his shop, playing guitar, pranking members of the crew, and spending time with Jess & Michael Gus. Random Trivia: Jess says Mike has many similarities with Bob from Bob's Burgers, only with slight hearing loss & mild OCD. A customer once called him "Yoda of vivariums", which Mike (a huge Star Wars fan) considers the best compliment he's ever received. While carrying a heavy vivarium down a short flight of stairs his ankle broke in two places, but he managed to save the vivarium on his way down. Jessica runs customer service & oversees order fulfillment, and is a (non-practicing) licensed cosmetologist. She's worked with over 35 different species of Reptiles & Amphibians over the years. Having grown up in & around garden clubs, Jess put her horticultural knowledge to work for NEHERP when she developed the Horticulture division in 2012. Since then, she's played an even more significant role from website development, to product selection, and especially in customer service. When Jess isn't managing NEHERP, she spends her time gaming, working with her pet frogs, playing piano, singing, hiking, and baking incredible food. She recently became a Mom to her & Mike's first child, Michael Gus! Mike W joined the team in 2013, just after the retail shop merged with the warehouse. Mike is an amphibian & reptile breeder, vivarium enthusiast, and horticulturist. Over the years he's become the supervisor for all warehouse operations from logistics to production. He spends his spare time growing terrarium plants, working with exotic animals, listening to great music, and hanging out with his Chihuahua. Since Mike started at NEHERP, his exotic pet & vivarium collection has grown to dwarf NEHERP's! Mike is a great guy who has the client's best interest in mind every day, and NEHERP wouldn't be the same without him. Random Trivia: We suspect Mike W may lead a double life as some sort of secret invincible ninja. He has displayed the ability to catch lightning-fast species using bare hands in a way that seems almost unnatural. He once fell off the back of a truck & had a 6-foot rack full of supplies fall on top of him without sustaining injury. He totaled his car during a lunch break and returned to work as if nothing had happened. When sledgehammers and crowbars failed to take down a wall during one of our construction projects, Mike W. kicked the wall down while wearing sneakers. He disappears and reappears in different places, keeps nunchucks in his car, and can do back flips. Is Mike W. a Ninja disguised as a reptile expert? You decide. Cam started as part of our VOAG crew, and has become part of the official staff over the past 3 years. He's able to churn out as many as 60 gallons of our NEHERP substrates per hour on our mixing machine, without sacrificing an ounce of quality. At home, Cam has a small but growing collection of Reptiles he cares for. Between substrate, greenhouse work, and lots 'o stocking fun, Cam is a big help at NEHERP. Random Trivia: Cam is the entrepreneurial type, and is one day expected to run his own reptile related empire. Ricky has been helping out here & there since 2015, and started his College career towards being a Zoologist in 2017. Nowadays he swings by during breaks from school to help out when he can. Between substrate, fly media, helping to pack orders, and a whole lot more, we're really glad to have Ricky on our team. Michael Gus loves playing with Ricky, so he's become Gus's unofficial babysitter at the shop. Random Trivia: Mike once pranked him, and Ricky has since gotten him back about 11,000 times with no signs of stopping. Just about every member of the team has been pranked by Ricky at some point. If you stop by the shop and hear someone scream, Ricky has probably struck again. The VOAG & HS Crew! Substrate Mixing, Fly Media Creation, Greenhouse Propagation, Plant Maintenance, Microfauna, & Other "Upkeep"! 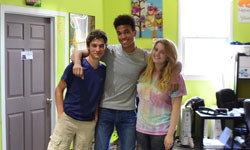 VOAG & HS students in central Connecticut can apply to work at NEHERP, and we're lucky enough to have a great team of students in the shop. 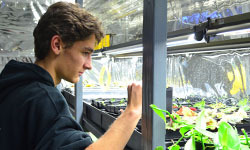 While on the job, students gain hands-on experience working with live plants, exotic animals, microfauna, and more. Less exciting parts of the job like maintenance & logistics instill young'uns with work ethic, which there's no shortage of at our warehouse. The "minions" as Mike W. affectionately refers to them are an important part of the NEHERP operation, and each student member has his or her own specialization, outside of the typical greenhouse stuff. If you are a central-Connecticut high school student or teacher interested in this program, please email Jessica to set up an interview. Jess & Mike's pride & joy, little Michael Gus comes to work with his mom & dad every day, and does an awesome job putting a smile on everyone's face. Mr. Gus Gus enjoys watching frogs jump around in the vivariums, watching snakes slither around in terrariums, and spends plenty of time running around the office at the shop. Our warehouse borders the New Haven–Springfield Railroad Line, and little Michael has become a tremendous fan of the passing trains. If you've called into NEHERP any time over the past months since he was born, chances are you've heard him making very cute sounds somewhere in the background. He's one adorable little man. 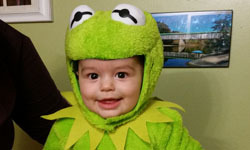 Random Trivia: One of Michael Gus's first words was frog, and by the time he was 14 months old he could identify & name Frogs, Snakes, Geckos, and Lizards. He has his own office at NEHERP, and his favorite animal bounces between hippopotamus ("heepopatus"), giraffes, and frogs depending on his mood. I was an exotic animal hobbyist throughout most of my childhood, and having the opportunity to do this as a career is absolutely surreal. Below, I've tried to document a rough outline of the past decade's events which brought me to where I am today, and brought NEHERP from concept to creation. While I was in high school, I kept a handful of different Reptiles & Amphibians as an enthusiast. It wasn't an especially large or spectacular collection by any stretch of the imagination, but it was a fun way to begin learning. A few years went by, and while I was working & in college, I began breeding some different species on the side. I started with Leopard Geckos, got into Day Geckos, Bearded Dragons, and a few more common species. After my first seasons as a small-scale breeder, I became even more enthusiastic about the herp hobby. Back then, I remember feeling critical of larger pet shops, whose husbandry methods (even while I was a beginner) seemed abysmal more often than not. I remember seeing little Leopard Gecko & Bearded Dragon hatchlings being kept bone dry on calcium sand, struggling to shed, and often times suffering from impaction. I can't forget seeing wild caught Anoles fighting in a tiny enclosure, housed next to captive bred Bearded Dragons, with a plastic divider separating the animals which allowed feeders to run back & forth between the two species. After doing a little research online, I came to the conclusion that not only were Anoles wild caught, but so were the majority of so many common species I saw at pet shops. (Animals like Green Tree Frogs, Chameleons, Iguanas, Tortoises, Turtles, Fire Bellied Toads, Monitor Lizards, Tokay Geckos, House Geckos, Whites Tree Frogs, Red Eye Tree Frogs, and so many more) I saw far too many frustrating instances of poor husbandry to list. Considering the frequency in which all these examples were out for display in the large retail pet stores, I personally came to the unfortunate conclusion that these problems might actually be commonplace within the industry. It wasn't a fun realization, and it's stuck with me to this day. Then I attended a Reptile/Amphibian expo. The vast majority of small business owners, breeders, and enthusiasts who were vending at the show proved to be an entirely different, more enthusiastic & far more educational resource compared a traditional chain or large-scale pet shop. In most cases, the health & vibrancy of the animals offered by many of the small-scale breeders was a notable improvement over any I'd seen in stores. I received great advice, was pointed towards lots of great online resources, and the experience drastically changed my perspective. On the way home from the expo I remember thinking, "These people know what they are doing! Why don't more full-scale businesses offer those kinds of animals, resources & support?". I continued working with a number of different species, and my hobby grew a bit larger. The animals I had been working with were always very exciting, but it wasn't until 2007 or so when something really jumped out & grabbed my attention. I built my first live vivarium. There wasn't much info on the subject available in stores or online, so I joined some hobbyist forums, got involved with the community, experimented by building lots of vivariums, and it was all downhill from there. I knew live vivariums were way too incredible to not become popular, there wasn't much informational support online, and there were only a couple places selling vivarium gear. I saw an opportunity. Both the positive & negative experiences I had as an enthusiast helped to shape what I wanted to see in a company. First & foremost, NEHERP would be a strictly "no wild caught" business. It was critical to offer respectable husbandry advice, and to follow the same high standards for any animal in our care. I wanted to create a customer service model similar to what one would expect at a professional expo, where our staff could speak from experience when offering advice. One last personal goal I set for myself was to beat the negative stigma some people hold toward this awesome, and often misunderstood hobby. The focus would be on live vivariums, and the company's goal would be to support everything related to the creation of these awesome enclosed environments. The ball really didn't start rolling until back in 2008, when I started testing different types of live moss in vivariums. Once I found a species which could thrive in a live vivarium environment, I began researching care & propagation techniques in hopes that I could eventually market the product. 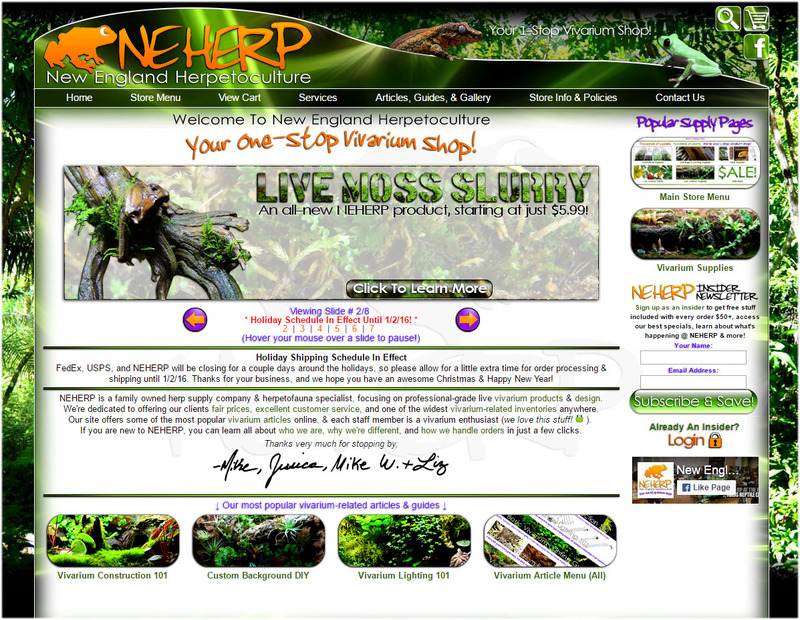 Eventually, the first samples of NEHERP moss were offered on forums for hobbyists to try, and with positive feedback on the product, we became the 1'st company online to offer pre-processed live moss for vivariums. During this time, NEHERP was an incredibly tiny basement business, with a grow room & stock area packed in a small space behind my apartment's kitchen. 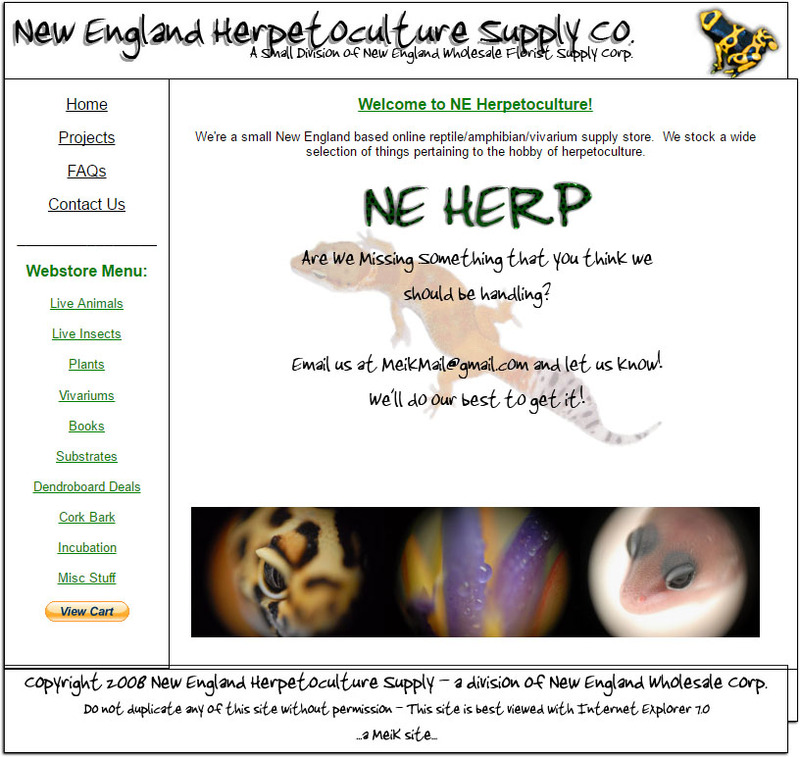 I grew up working for my family's business New England Wholesale Florist, and so the name "New England Herpetoculture" seemed like a natural choice. 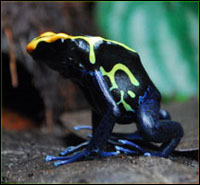 When neherpetoculture.com first launched in late 2008, there were only a tiny handful of mostly dart frog & vivarium related supplies available. The website I wrote was terrible (no really - just god awful), the selection was sparse, but our plants were top-notch. 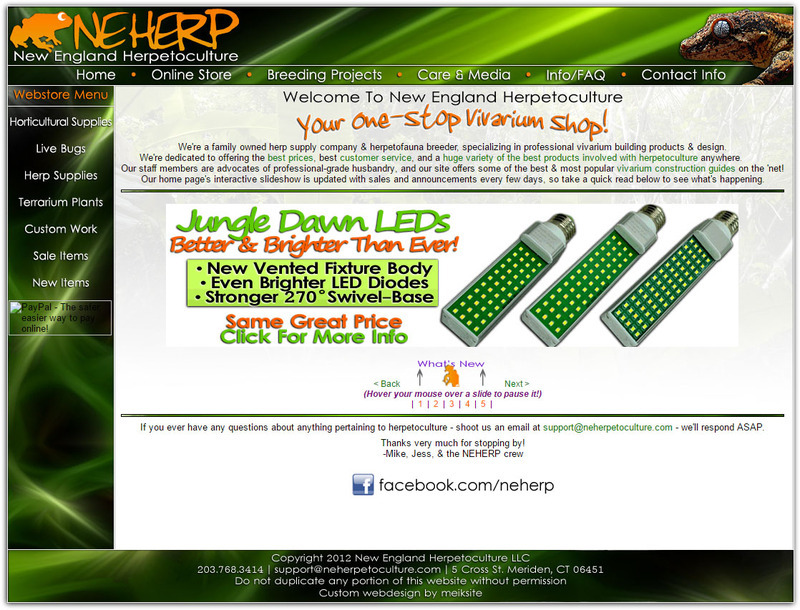 Friends & fans of our small business helped spread the word on forums, and we began offering a few brand names of herp supplies along with an increased plant selection online. By 2010, the variety of live animal projects had drastically increased to nearly 200 individuals. At this point, NEHERP began sharing warehouse space with another family business. The next couple years sped past with the site's popularity increasing, and the supply selection expanding from a few dozen products, to a few hundred. 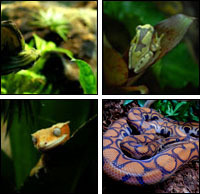 Towards the end of 2010, NEHERP opened a small retail store in New Britain CT, which offered everything available online plus an assortment of (strictly) captive bred, and often locally-bred reptiles & amphibians. During that time, the shared warehouse space in Meriden was primarily used for overstock supplies & plants, and the day-to-day business & online order processing took place at the retail shop. The 3'rd version of our website launched around the same time the retail store opened, and while it was a small step in the right direction, it was still extremely basic. We added Exo Terra brand products to the lineup in January of 2011, and they've been some of our best selling products since. The Vivarium Construction 101 article was one of NEHERP's main turning points, and is our most popular informational page to this day. It's strange to think about it, but the 1'st version of the article was quickly written while I was sitting behind the retail store's front desk, during lulls in sales when I was done packing orders for the day. The article helped to grow our web traffic considerably, and encouraged us to eventually expand it, and write far more articles as time went on. VC101 quickly became the most detailed, and one of the web's most popular online vivarium building guides. 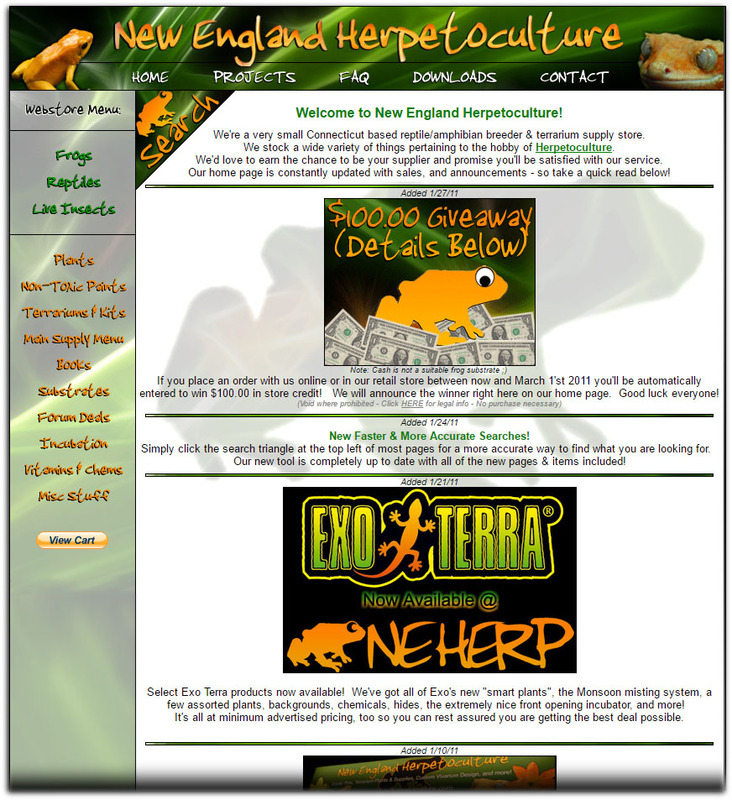 In late 2011, an enthusiast walked into the New Britain retail shop and changed both my life & the direction of New England Herpetoculture from that point forward. Jess & I quickly began working together full time to further develop our best-selling Vivarium Substrate, Drainage Layer Substrate, Fly Media, Horticultural division, and more. These NEHERP brand products are our best selling hard supplies to this day, and have earned our absolute highest customer reviews. It wasn't long before the quickly growing website drastically overshadowed the store, and Jess & I made the tough decision to merge the retail shop back into the original warehouse space. With the added space & customer suggestions in mind, our store was expanded to offer one of the widest selections of vivarium related supplies online. 2012-2013: The Warehouse Merge, Articles, & Mike W.
With the new products launched, things began to grow at a quicker rate. I finished the 4'th version of our website in 2012, and it was wasn't as terrible as the older versions. That was the first time our stylized " " logo was used, and it's been on every version since. A lot of new items & articles were added, and we also created our first enclosure specific Vivarium Kit products. We didn't realize it at the time, but these "vivarium kit" products were a big part of the future for NEHERP. In 2013, we hired our 1'st full time employee Mike W, who has been with the company ever since. 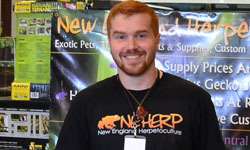 (Nowadays, he's warehouse supervisor) Mike W's herp hobby quickly grew from a few frogs to a few dozen species, and the expertise he gained over the years has helped NEHERP design new products & write new articles for the site. If you've ordered from NEHERP since 2013, you've probably received a box prepped & packed by Mike W.
By the end of 2013, we outgrew our grow room, over-supplied our supply room, and the website was due for yet another re-write. 2014-2015: More Products, Growing Pains, and a Wedding! NEHERP V.5 launched in early 2014, was NEHERP's first 100% fully hand-coded site, and was the biggest improvement yet. Client reception was pretty positive, and the team was floored. Finally a halfway decent website! Between the new site & revised care articles, search engine rankings during this time put our company within the top 3-4 results for topics related to vivariums. Shortly after the site launched, a handful of new products were released too. NEHERP Substrate V2 was great for a bunch of different species, and was a real hit with the Gecko, Snake, and Tree Frog hobbyists. Modular Cork Planters & Gecko Background Kits were also pretty popular with the Gecko keeping community. Other new products included a freshly revised Fly Media, NEHERP Glass Inserts, Custom Background Texture Mix, Vertical Conversion Kits, and tons of new wood decor options. The most popular development was our NEHERP Moss Slurry, which took nearly a year of testing to develop. At the end of 2015, we started expanding into a new area of the warehouse. Our greenhouse area was tripled, our supply room was doubled, and our "wood room" was an entirely new development. While we were glad to have added a considerable amount of space to the supply-end of things, we were still stuck with a tiny 250sq/ft office for 3 employees (and 17+ vivariums!). We were cramped, to say the least! Jess and I were finally married in July of 2015. It sounds like a happy ending, but it gets even better. 2016-Present: New Website, Location, and Baby! I was able to launch Version 6 of our website (the current one) in January 2016, after months & months of coding. Our little company has managed to get within the top 1-2 search engine results for most vivarium related topics, and I'm thrilled that the new site has been so well received. There are lots of new features to mention, but the most pivotal is probably the Vivarium Builder, and it's supporting Vivarium Kits. We now offer over 170 different vivarium related kits for all 30 of the most common enclosure sizes, making ours the most comprehensive vivarium support website online. We updated our Background Decor Kits (both light & heavy duty), Vivarium Substrate Kits, Lighting Kits, and of course revamped our Complete Kits. Each kit is enclosure specific, and can be custom-tailored around the needs of a specific species. Some kits have different options to customize according to a client's end-goals. In all, there are over 1,000 possible configurations using the Vivarium Building Tool. We're proud of it, and it's already proven to be our most popular store related page since the new site launched. By February 2016, each of the vivarium-related articles was re-written again to include the most up-to-date information, in an effort to offer the best support to our clients. My favorite part of this whole story took place in April of 2016, when Jessica & I welcomed our son Michael Gus into the world. He's terribly cute, and spends every day with us in NEHERP's office. By early 2017 our staff had grown considerably, and we finished moving to our largest space yet. The new spot allows us to stock nearly twice as many vivarium related products, pull orders with much more efficiency, and has made a significant difference for the team. Also, our office is finally large enough to walk around in, which was a refreshing change to say the least! From the bottom of my heart, I'd like to take this opportunity to thank our clients for choosing NEHERP over the years. Thank you for allowing me to start this company, and thank you for supporting what we do. Considering that I met Jessica when she came into NEHERP's old store, the incredible truth is this... Without the support of you (our awesome clients), I'd have never met Jess. Without the support of this awesome hobby, our son might not exist. Needless to say, "I owe you one". Jessica and I plan to spend the rest of our careers helping fuel the herp hobby, Zoos, Nature Centers, and Educational Facilities which have done so much for us by supporting our family's business. Thank you for your trust, business, and continued support! Our retail store scored 100% grades at every inspection by the Dept. of Ag.